Janna, Jodi Ann, Lauren, Lise, Maria, Mariska, Nikki, Sarah, Vicki, and Cyndi. fun card becky..love the fresh colors! oh, my goodness, this is even cuter than yestrday's card. there is just something about Billy that always makes me smile! Absolutely LOVE your Colouring and this layout is the Best!!! That little pup cracks me up!!!! 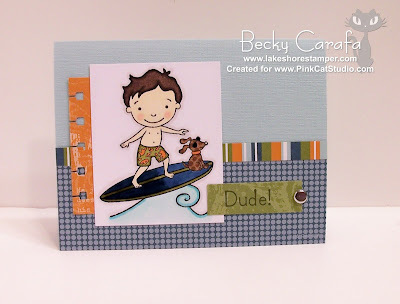 Love these fun colors, Becky, and the spiral punch is just perfect here! Hey Becky! Oh my what a cutie!! I really love Surfer Billy! It feels like summer looking at him surf! LOL! Beautiful job on your coloring and great use of the spiral edge punch! I need to use that punch more often!! Great job on your sneak peek!! SO cute!! Love the colors and layout, very fun and cool for a boy. Love it! So cute!! Love the colors you used and the layout of your card. Love those papers too, they are perfect for a boy! What a fun and cute card! I love it!! I just love the fun color combo and layout! I had to CASE it right away! So cute Becky! Love this! So cool sweetie :). Love the dotted dog and the spiral edge punch! !